Yes, yes, I know I’m writing about Adnams again but that’s because it’s perhaps the most progressive of the old established brewers in Britain and regularly has new things to shout about. Anyway some friends and I, including fellow blogger The Guest Ale (until this point an Adnams sceptic, you can read his take on the same event here) couldn’t resist the offer of £10 tickets for a guided tasting of Adnams’ many beers in September in the company of its head brewer Fergus Fitzgerald. And what a well spent £10 it proved to be. Given the surroundings, downstairs at the Adnams Cellar & Kitchen store in Bloomsbury, a tasting of Adnams ales in cask-conditioned form would have been impractical. And the company doesn’t produce bottle-conditioned beers due to their wide distribution and requirement for a decent shelf-life. Nonetheless, Adnams beers seem particularly resistant to the brewery conditioning process that often knocks the stuffing out of many other breweries’ products, managing to maintain the house character derived from the Southwold brewer’s uniquely spicy yeast. Either that or Adnams has developed a far more sympathetic process. 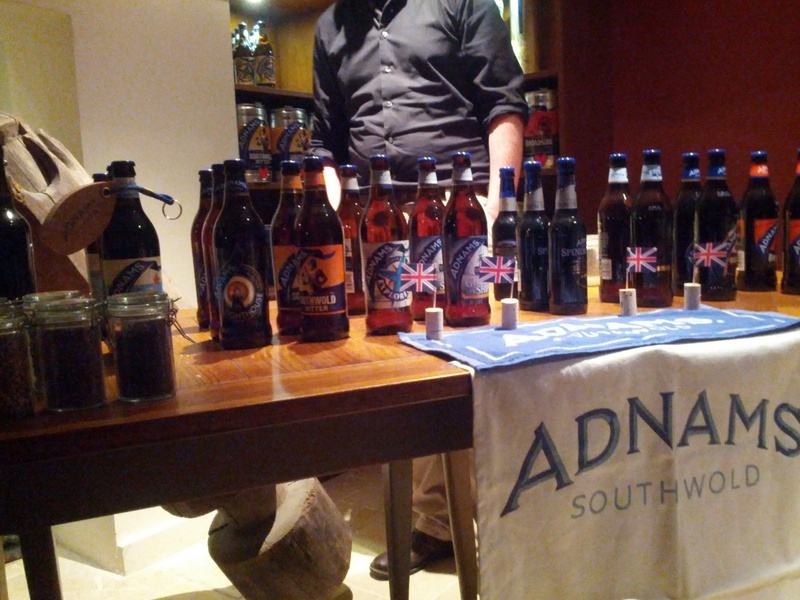 After gathering in the ground floor shop the 40-50 attendees were led downstairs to the store’s tasting room (usually used for wine tastings – Adnams is also a sizable wine merchant) where we were handed a glass each of Adnams’ latest brew Topaz Gold (4.0%) from a mini-cask. Brewed with two Australian hops, Summer and Topaz, Topaz Gold avoids the one-dimensional citrus hop conformity that many brewers’ fixation on New World hop varieties. 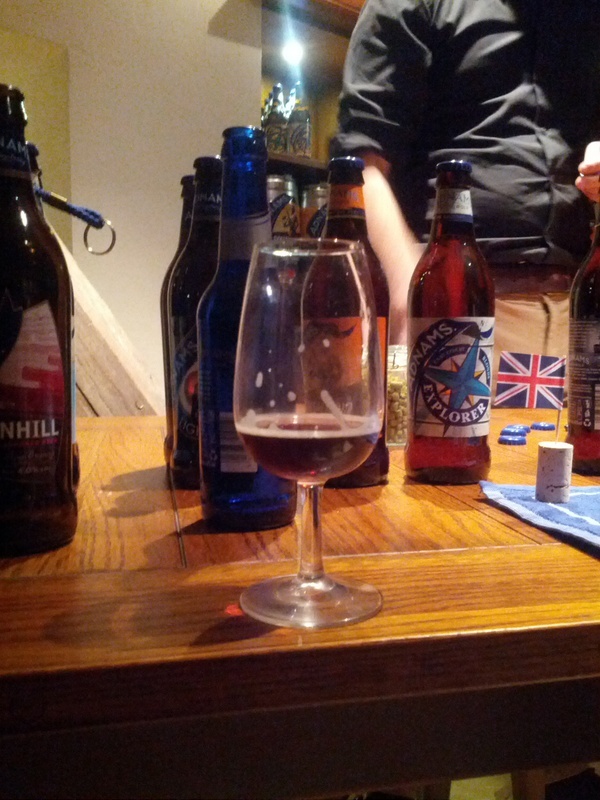 Rather the Aussie hops actually complement Adnams’ biscuity and spicy house character. If there are still any mini-casks going for £12.99 I’m tempted to pick one up. 3) Southwold Bitter (4.1%) – Adnams’ classic best bitter, slightly stronger in bottles but with much the same flavour-profile as its cask cousin. Copper coloured and beautifully balanced, one of the few beers I’m confident of identifying in a blind tasting even in bottled form! 11) Ginger Beer (2.5%) – made from the same mash as bottled Broadside and flavoured with ginger, orange peel, lemon and lime zest and a little sugar this is very different to most new wave ginger beers today and rather nice for what it is. Adnams famously vinous, old-school barley wine, Tally Ho, was an unfortunate absentee, being currently out of stock. However, its absence was more than made up for by the special appearance of a one-off brew – a pot stoppered litre bottle of oak-aged, cherry refermented bottle-strength Broadside. Fitzgerald admitted he had no idea how strong this powerfully-flavoured, somewhat unctuous fluid was, although it was probably around 8%, maybe stronger. I doubt Adnams could ever commercialise such a product but it’s yet another example of this old family brewer thinking on its feet like a startup while utilising the experience and wisdom that 150 years of brewing and selling beer has bestowed on it. Of the ten brews sampled, only three had existed before Fitzgerald’s arrival at Adnams and that’s not including the range of special brews overseen by the Irishman that have included (appropriately) an Irish Dry Stout, a Dutch-type Bokbier and a Cologne-styled Kölsch among others. Some of these have made it into bottle briefly before and Fitzgerald said they may do again.